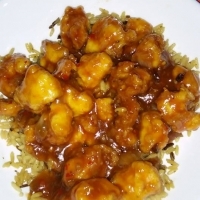 Great restaurant style general tso chicken. Not too spicy. If you don't have oyster sauce, chicken broth can be used instead. An AR recipe by Mel. Coat the chicken pieces with 1/4 cup of cornstarch; set aside. Beat the eggs, salt, and pepper in a mixing bowl. Stir in the flour and baking powder and whisk until no large lumps remain. Mix in the chicken until evenly coated. Heat the vegetable oil in a wok or large skillet over high heat. Drop in the chicken pieces; cook until golden brown and no longer pink on the inside, about 12 minutes. Set the chicken aside; keep warm. Because the batter mixture is quiet sticky I use a fork to help separate the chicken pieces once the chicken is in the oil. In a separate medium size sauce pan on medium-high, heat the sesame oil, ginger, and green onion. Cook and stir until the onion is translucent and the ginger begins to brown, about 1 minute. Pour in the water, vinegar, and sugar; bring to a boil. Dissolve the cornstarch in the soy sauce and add to the simmering vinegar along with the oyster sauce, ketchup and chilli paste. Stir until the sauce has thickened and is no longer cloudy. Return the chicken to this pan and toss until evenly coated. Like Stellasmom's recipes? Never miss an upload!